1. 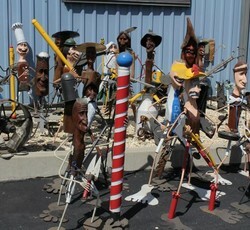 Huge collection of RL Blair wood and metal sculptures: Caricatures of all kinds, Miner, musician, bango player, fiddle player, drummer, miestro, baseball player, priest, fire fighter, lineman, indian, cowboy, alligator wrangler, blacksmith, dentist, dr, fisherman, hunter, hippy, outhouse, railroad car, oversized circus trike, cannon.....and so many more. All amazing and unique! 12. Large, very large safe. This is such a fun sale. More details & photos coming. Sale dates and times may change so please keep checking back for additions and changes.